At my workshop on Saturday, I was blown away that a woman named Meghan, who’d been in touch with me about a crochet pattern I wrote that has some kind of mysterious error we can’t figure out, came up for the event from Seattle with a friend. But the part that made the tears come was that she brought a book to give me, to read with Owen. This simple gift was so perfect, and so warmly given, that I’ll never forget how I felt when she handed it to me. 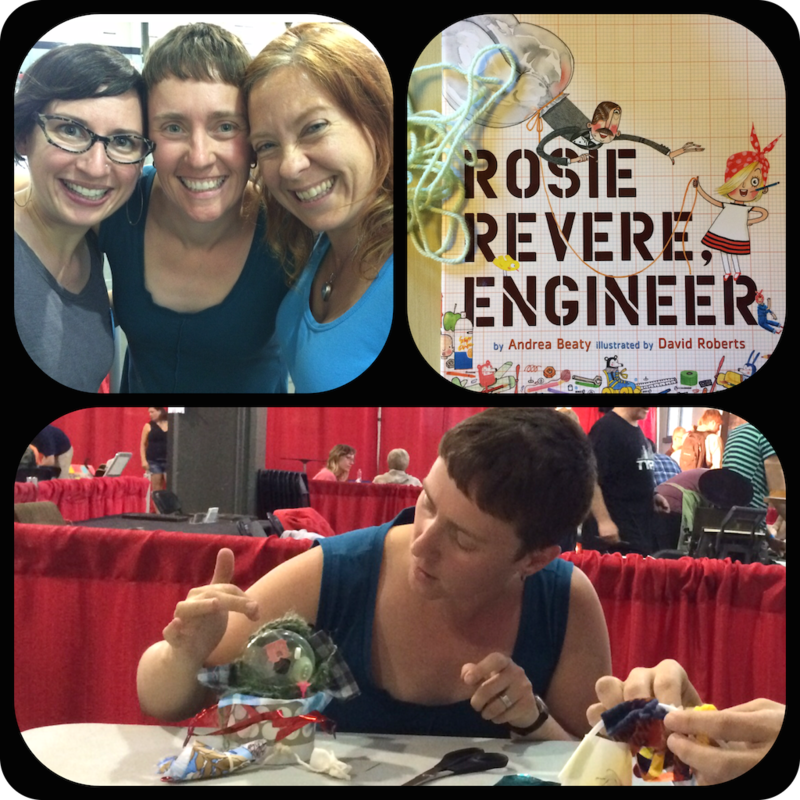 Rosie Revere, Engineer is my new favourite kids’ book. It’s brilliant. It’s about kids who make stuff and adults who respond to the stuff kids make and the power of those responses; it’s about failing and trying again; it’s about history and the future; and it’s an exceptional feminist work. When I read through it for the first time the morning after Meghan gave it to me, I burst into tears. It’s that good. And when I read it to Owen last night, he immediately asked me to read it again. The rest of VMMF was on par with this experience. I moderated a panel about making money, and the panelists were wonderful and generous and informative. I gave a talk about the stories we tell ourselves about failure, and when I sat down cross-legged on the stage and asked the audience to come closer and gather ’round, they did. I loved catching up with people I’ve managed not to see in a whole year, and I loved meeting new people. And I already have ideas for things I want to do at next year’s event. Which is a very good way to end the weekend!